On Saturday (2nd of June) the 2012 grand Slam champions Wales will play the Barbarians. This is an annual tradition, and it will be Wales’ warm up match before they embark on a tour of Australia, during which they will play 3 Test matches against the Wallabies. 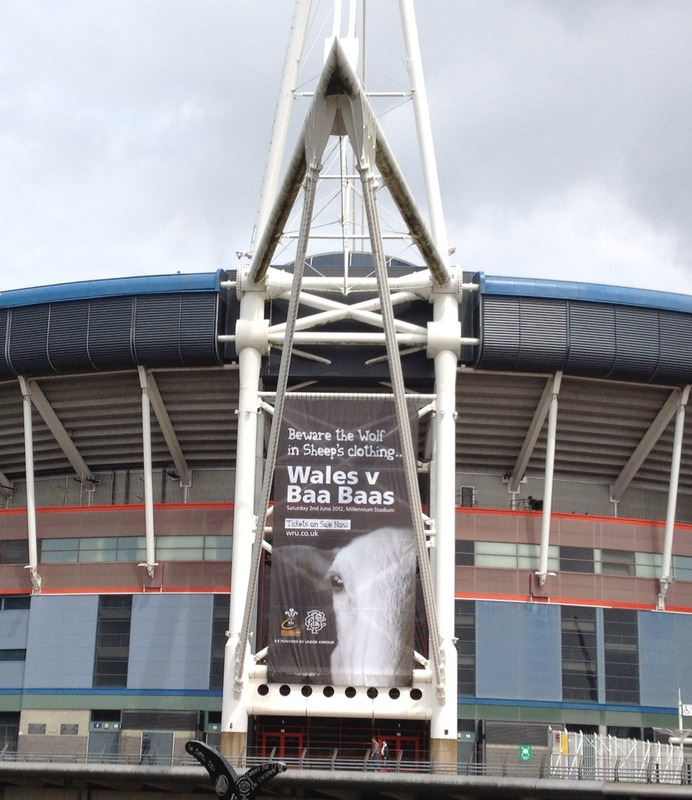 Banner on the Millennium Stadium advertising the upcoming game between the 2012 Grand Slam Champions and the Barbarians on the 2nd of June. Although the Barbarians have not announced their team yet, it will almost surely include Shane Williams, who retired from playing for Wales in the game against Australia last December, and who played his last game for his club The Ospreys on Saturday when he helped them win the Pro-12 league by scoring two tries. He is Wales’ record try scorer, and the words “elusive runner” barely begin to describe him. Shane Williams first burst onto the international scene in the sensational Wales v New Zealand match in the 2003 World Cup. You can watch highlights of that match here, or if you want to watch the entire game it is here. The Barbarians are an invitational team, and by tradition only get together a few days before a match to train. 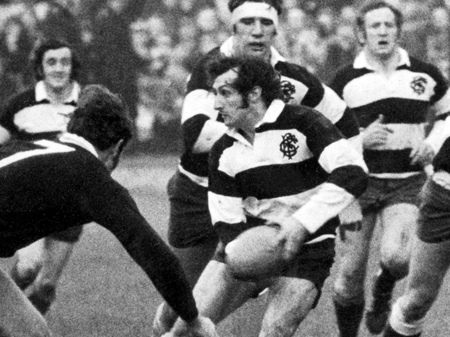 The most memorable game of rugby I have ever seen was the famous match between the Barbarians and the All Blacks (New Zealand) of January 1973. I was lucky enough to be at this game. I will have to ask my father if it was my first trip to Cardiff Arms Park, but I distinctly remember taking our seats in the South stand in the first few minutes (we must have been late arriving), only for everyone around us to get on their feet as Gareth Edwards scored one of the greatest tries the game of rugby has ever seen. (this video has had nearly 2.5 million views on YouTube!!). The whole game was played in an amazing spirit, both sides deciding to run the ball from everywhere. The full match is also available on YouTube, you can watch it below. I will be on my way to the Gobi desert to observe the Transit of Venus next week when this match is played on Saturday. I will, unfortunately, not only miss this game but also Wales’ first test match against Australia in Brisbane the following Saturday. I will be back in Wales in time to see the 2nd and 3rd tests of our 3-match series down under, and as I have said before, if wales win 1 or 2 matches in this series then expectations that we are seeing the dawn of a new “Golden Era” in Welsh rugby will be sky high. The Arthurian legends are probably the best known of the Welsh (Celtic) legends which have, collectively, become known as The Mabinogion. The word Mabinogion is, in fact, a mistake. When Lady Charollete Guest translated the medieval Welsh texts she picked up on the use of the word “Mabynnogyon” which occurs at the end of one of the stories in the four branches of the Mabinogi, and gave this name to all the Welsh legends she translated. 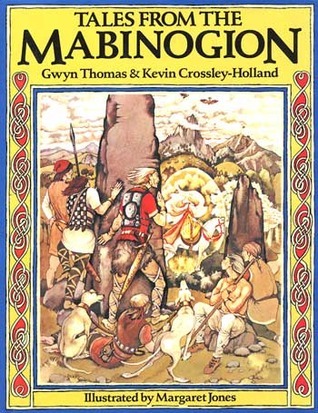 The cover of a book of an English translation by Gwyn Thomas of the Mabinogion aimed at children, with wonderful illustrations by Margaret Jones. Her collection, The Mabinogion, are contained in 3 volumes, and are a translation of folk tales which include the Arthurian legends, including the romances Owain, Peredur and Geraint ac Enid (this last one served as the basis for Alfred, Lord Tennyson’s two poems about Geraint in the Idylls of the King). Volume 2 contains the romance Culhwch ac Olwen and The Dream of Rhonabwy. The four branches of The Mabinogi are contained in Volume 3. The earliest manuscript found which contains the 4 branches of the Mabinogi is the White Book of Rhydderch, which was (hand) written circa 1350. But, in fact, the stories are much older, many are pre-Christian tales, which would have existed orally amongst the Celts for many centuries, before being written down. Studies of poetry in some of the stories dates the writing down of the stories to about the 11th Century, but the oldest existing copies we have of the stories are from the 14th Century. The reason the poetry is used to try to date when the earliest written forms would have been made is because poetry changes less than prose in oral stories. The many supernatural elements to the stories indicate that they are part of a very old, pre-Christian, body of Celtic mythology. Arthur himself, although he may have been a real Brythonic king, had become a character of mythology by the 5th-6th Century amongst the Celts. One of the mythis is that he and his soldiers are sleeping in a cave, but will one day awaken to defend the Celts (presumably now the Welsh as we are the closest ancestors to the Brythonic Celts). The song in the video below, which is by a band called Edward H Dafis, is called “Drudwy“, the starling who acted as a messenger between Branwen and her brother Bendigeidfran whilst she was imprisioned in Ireland. The story of Branwen forms the 2nd brach of the Mabinogi. The story describes Branwen, and her brother Bendigeidfran, who is both king of Britain and a giant. Branwen is given as a wife to Matholwch, the king of Ireland. However, Branwen’s half brother Efnisien feels insulted that he was not consulted about the marriage, so he mutilates Matholwch’s horses in an act of revenge. Because of this, Matholwch punishes Branwen by banishing her to the kitchen of his castle in Ireland, and beating her everyday. 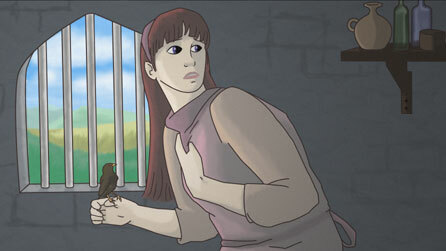 In order to inform her brother Bendigeidfran back in Wales of her plight, she teaches a starling, drudwy in Welsh, to understand her and transfer messages for her. 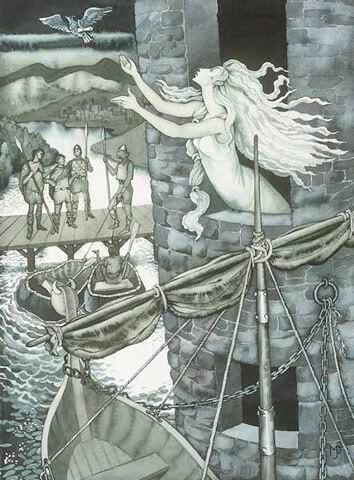 Drudwy flies from Ireland to Wales, and informs Bendigeidfran of his sister Branwen’s plight. Bendigeidfran then goes to war against Matholwch, and brings his sister back to Wales. Gweler Branwen wrth y tân. Drudwy fechan yn y man. See Branwen by the fire. Tiny starling do it now. I played this song to my daughter Esyllt a few months ago as she was studying the story of Branwen in school. The school chose to perform the story for their summer concert, which will be in July. A few weeks ago they held auditions for the main part of Branwen (and the other lead parts), and Esyllt was successful in getting the lead part. She has many lines and songs to remember, so is busy learning them. But, she is blessed with the same outstanding memory that her brother Meirin has, so already she knows most of her lines and the concert is not for another 6-7 weeks. Her name, Esyllt, comes from another one of the Arthurian legends contained in the Mabinogion. Esyllt was the lover of Trystan. These two names are better known to non-Welsh speakers from Wagner’s opera Tristan and Isolde, Isolde or Iseulte being the English/international translations of Esyllt. Maybe one day Esyllt will get a part in an opera or play where she will be playing her namesake. She took the CD on which this song “Drudwy” is contained, namely “Yr Hen Ffordd Gymreig o Fyw” (The old Welsh way of life) into school, and now the song is going to form part of the concert. I remember seeing my first ever New York City marathon on TV in 1981. Although I had probably seen Olympic marathons, I don’t think a city marathon had ever been televised before. It was won in that year by Alberto Salazar, and it is the NYC marathon that led Chris Brasher to organise the first ever London marathon, which was held in April 1981. By the mid 1980s, most major cities were hosting marathons. The number of people competing in marathons mushroomed, so that now there are over 500 full marathons organised worldwide. The daddy of big city marathons is the Boston Marathon. It is the oldest annual marathon race in the World, first run in 1897! The list of winners over the years is like a who’s who of great distance runners. However, because of the nature of the course it cannot be used for world record times. There is too much of an altitude difference between the start and the finish, unlike e.g. London, New York, Chicago or Berlin. My three marathon heros are Steve Jones, Haile Gebrselassie and Paula Radcliffe. Steve Jones is the only marathon world record holder Wales has produced, and I have had the honour of running in the same race as him, the Swansea Bay 10k. Not surprisingly, he won the event. But what is remarkable is that he had run and won a 10k race in Bristol that morning! 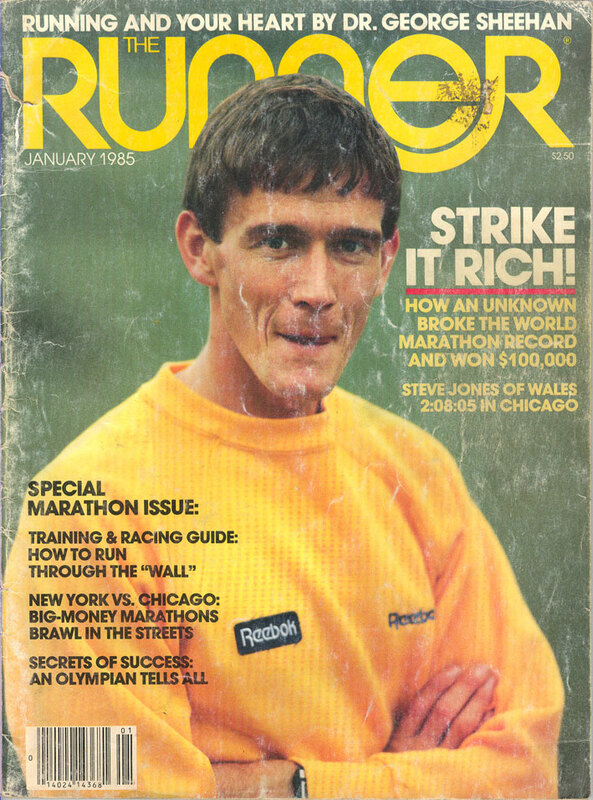 I remember seeing his winning and setting the World record in the 1984 Chicago marathon, and was very proud a Welshman should achieve this. 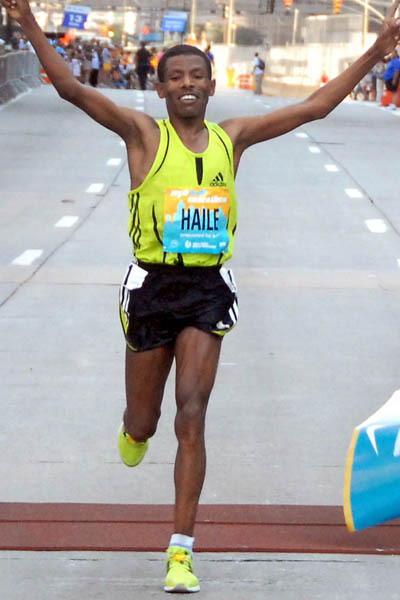 Haile Gebrselassie is my long distance running hero. He has dominated long distance (5,000 metres and above) running for the two last decades, winning his first World title in 1993. He won the 10,000 metres in the World Championships on 4 successive occasions (1993, 1995, 1997 and 1999), and the Olympic gold in the 10,000 metres on two successive occasions (1996 and 2000). As recently as 2008 he set a marathon World record, in Berlin. But what I like most about Gebrselassie is that he is so modest. I heard him being interviewed on BBC Radio 5 a week or so after he dropped out of the Berlin marathon last year (2011), suffering from breathing difficulties brought on by his asthma. I was taken aback by his modesty and generosity to his competitors in this interview, a man who has won everything and dominated everyone in long distance running was not even willing to concede that he is one of the all-time greats. He also always seems to have a smile on his face, and from what I understand has ploughed a huge part of the money he has made from running back into helping those worse off in his native Ethiopia. Anyone who has lived in the Disunited Kingdom in the last 10 years will think of Paula Radcliffe as maybe the best marathon runner Britain has produced. I still vividly remember seeing her win the 10,000 metres in the European Championships in 2002. She completely destroyed the field, winning by nearly a lap. In 2003 she set her remarkable marathon World record of 2h15m25s, a time only she has come anywhere close to beating. Sadly for her, her two Olympic marathons of 2004 and 2008 have been disasterous. In the Athens Olympics of 2004 she dropped out at 36km, probably due to some anti-inflamatory drugs she had been taking in the weeks prior to the race, which hindered food absorption. In the Bejing Olympics of 2008 she came 23rd, her peformance being affected by an injury she had in the weeks leading up to the event. A few months later she won the 2008 NYC marathon, showing that when on form she could still beat pretty much anyone. I am really keeping my fingers crossed she does will in this year’s Olympics, as it will be a fitting finale to a remarkable running career. In a recent interview on BBC Radio 5, she said that her body could no longer cope with the level of training she did 8-10 years ago, when she set her fastest times. But, she also realises that she would not need to run anywhere close to 2h15m to win in London 2012, so has tailored her training accordingly. The distance of the marathon has undergone some changes over the years. The now accepted distance of 42.195 km (26 miles, 385 yards) was not agreed upon until 1924. When the modern Olympics were revived by Baron Pierre de Coubertin, and it was decided the marathon would be included, the distance from Marathon to Athens was measured. The shortest route from Marathon to Athens is over a mountain, so it was felt that Pheidippides probably took a slightly longer route around the mountain. This was found to be approximately 40 km (25 miles), and so the marathon race in the first few modern Olympics was roughly 40 km. The table below shows the distances of the first 7 modern Olympics, from 1896 to 1924. In 1924, for the Paris Olympics of that year, the distance was set at the same distance as the 1908 London marathon, namely 42.195 km or 26 mies, 385 yards. Ever since, this has been the official marathon distance. Of all of the marathons in the early years of the modern Olympics, probably the most famous is the 1908 London Olympics marathon, sometimes known as “Dorando’s marathon“. The nickname comes from the Italian runner, Dorando Pietri, who entered the stadium in first place, but was completely disorientated. The length of the 1908 London Olympics course had undergone several changes in the lead up to the event. Originally, a 25 mile (40 km course was planned from Windsor Castle to the Olympic stadium in White City, Shepherd’s Bush. After protests about tram lines in the last few miles, and a decision to move the start to move the start slightly, the distance ended up being 26 miles to the Stadium. Then, at the request of Queen Alexandra, 385 yards were added so that the marathon would finish in front of the Royal box. 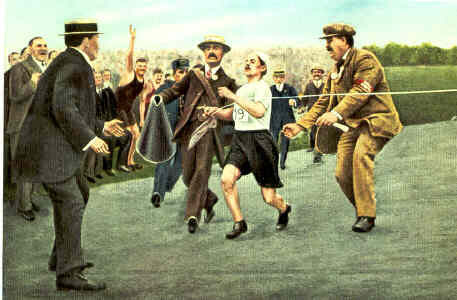 Pietri fell several times in the 385 yards inside the stadium, and ended up being helped across the finishing line. He was disqualified, and the Gold medal was given to the American Johnny Hayes. But, Queen Alexandra was so taken by the plight and bravery of the little Italian that he was awarded a special silver cup by her on the following day. Because the terrain of marathon courses vary, for a long time the International Association of Athletics Federations (IAAF) would only consider a “world best” for the marathon, rather than a world record”. This was changed in recent years. The table below shows the improvement of the mens’ and womens’ world marathon records over the last few decades. This Sunday (27th May) I will be running the Edinburgh marathon. This will only be my second marathon, I ran my other one 30 years ago in 1982! It was the second ever Cardiff marathon. I did obtain a place in the 1983 London marathon, back in the days when it was first come, first served. I queued all night outside the post office in Sloan Square during my first few months at Imperial College. Unfortunately I did not start the 1983 London marathon, some 6 weeks before hand I developed shin splints, probably due to overtraining. This time around, 30 years on, I have been far more sensible about my training. Apart from my training going off the rails a little during and after my holiday in Cuba, I feel my training has gone well. I’ve done three 20-mile runs, and probably another 4 or 5 runs over 15 miles. I haven’t suffered any injuries, and now with only 5 days to go before the big day I’m getting really excited (and a little nervous). Obviously, the frequency with which I have done marathons says it all – it is not a distance I like. It is way too far.I much prefer 5ks, 10ks and half marathons. I guess we shall see whether I ever do a 3rd marathon, and if I do whether it will be in another 30 years’ time! So who do we have to blame for this ridiculously long run of 26 miles 385 yards (42.195 km)? We can blame it all on Pheidippidees, a messenger. Legend has it that he ran from the Greek city of Marathon to Athens to announce the victory in battle of the Athenians over the Persians in 490 BC. 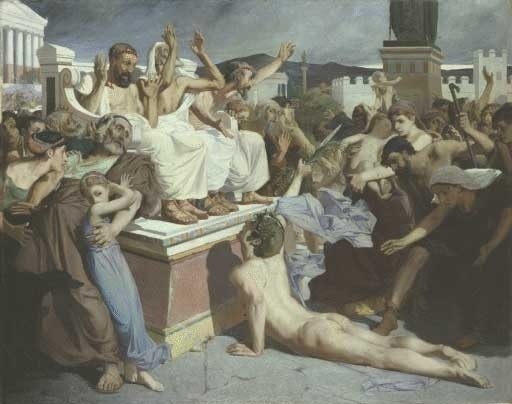 The legend also says that, upon reaching Athens and announcing the victory, Pheidippides dropped dead of exhaustion. When the Modern Olympics were revived in 1896 by Baron Pierre de Coubertin, the distance from Marathon to Athens was measured at approximately 25 miles (40 km). The marathon at the 1896 Olympics was won by Spiridon (sometimes spelled Spyridon) Louis (appropriately of Greece) in a time of 2h58m50s. By today’s standards this is a pretty slow time, but it may not have been helped by Louis apparently being fuelled along the way by wine, beer, milk, orange juice and even an Easter egg! Tomorrow I will give the story behind the marathon’s distance being increased to the now standard distance of 26 miles 385 yards. 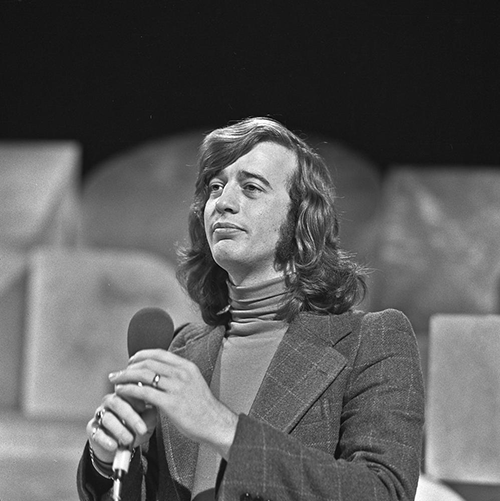 I woke up this morning to hear the sad news that Robin Gibb has died. He had been battling colon cancer for several years. When I was growing up, the Bee Gees (Barry, Maurice and Robin Gibb) were massive, mainly due to writing the soundtrack to Saturday Night Fever. For a number of years, the album was the biggest selling album ever. I was never particularly into the disco music the Bee Gees were singing in this period, but I discovered their earlier stuff from the late 1960s, and I am still a huge fan to this day of this era of the Bee Gee’s music. My favourite Bee Gees song is probably “Words“. Other favourites of mine from their early era are “Massachussetts“, “I started a joke” and “New Your Mining Disaster 1941“. The sheer range and variety of songs the Bee Gees wrote is staggering, many for other people. Songs like “Islands in the stream”, “Chain Reaction”, “Grease”, and “Woman in Love”, all major hits for other artists, were written by the Bee Gees. With Maurice, Robin’s twin brother, dying in 2003, now Barry is the only remaining Gibb brother (Andy Gibb, who has never part of the Bee Gees, died of a drug overdose in 1988). 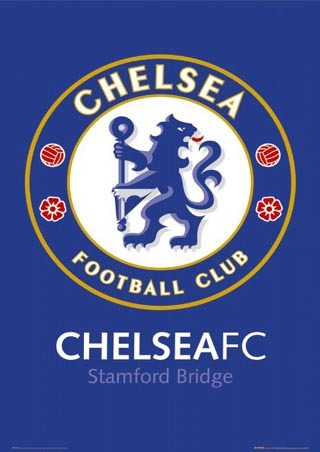 Tomorrow (Saturday), my team Chelsea are playing in the UEFA Champions League final against Bayern Munich (Bayern Munchen). The annual Champions League final is the biggest game in football next to the World Cup Final. For the team who wins, it represents a bonus of some £50 million in increased revenue. For English teams, if they finish in the top 4 of the domestic English Premiership, they qualify for the following season’s Champions League, a huge fillip to their revenues. This season (20011-12), Chelsea have failed to finish in the top 4, for the first time in quite a few years. However, should they win the final tomorrow, they will be allowed to defend their title next season, meaning Tottenham Hotspur, who finished 4th in the Premiership, will not qualify. Needles to say, Spurs fans are willing Bayern Munich to beat Chelsea. 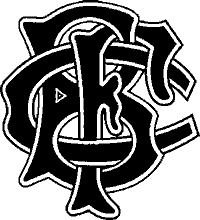 Why do I, someone who grew up in Pembrokeshire, support an English club based in London? It’s all because Chelsea happened to win the 1970 FA Cup final, which was the first one I remember. Within a few months of this win, my parents had bought me a Chelsea football kit, which I used to wear when I played my “fantasy” games outside in the back garden. My heroes of the 1970s team were Peter Bonetti, the Chelsea goalkeeper, and Peter Osgood, the centre forward. This might indicate my schizophrenia over my preferred footballing position, sometimes I wanted to be a goalkeeper and sometimes I wanted to be the one scoring the goals! 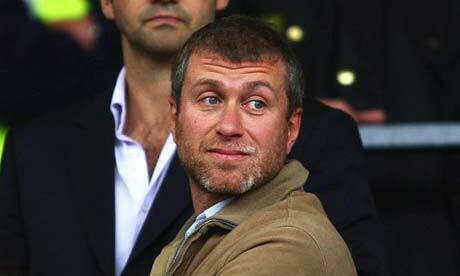 Chelsea didn’t enjoy a huge amount of success between 1970 and 2003, but that all changed when the club was bought by Russian billionaire Roman Abromovich. In addition to spending hundreds of millions of pounds on new players, he brought in José Mourinho, the manager who had taken Porto to the Champions League title in 2004. Under Mourinho, Chelsea enjoyed their most successful period in their history, winning the Premiership back-to-back in the 2004-05 and 2005-06 seasons, the FA Cup in 2007 and the League Cup in 2005 and 2007. Mourinho left under suspicious circumstances in September 2007, and since then Chelsea have not kept a manager for more than 1 season. This season started with André Villas-Boas as the new coach, but he was sacked in March of this year, to be replaced by the “interim” coach Roberto Di Matteo. The switch of manager seems to have turned Chelsea’s season around, they went on to win this season’s FA Cup, beating Liverpool in the final, and have made their way to the final of the Champions League, the biggest prize in club football. This is the second time Chelsea have reached the final, they lost to Manchester United 6-5 on penalties in 2008. I am keeping my fingers crossed that we can win it this time around, I will be glued to the TV tomorrow evening, hoping all the money Abramovich has spent in the last 10 years can finally see Chelsea claim the ultimate prize.